but our afternoon was even more memorable! we were drawn to so many beautiful oases in the desert. I can’t wait to take you to two of my perennial favorites! We seek out these breathtaking oases each time we visit our family nearby. Follow me…. but watch your step! Don’t worry. I have been here many times. The lower Salt River winds its way through the Tonto National Forest. in the midst of the harsh Sonoran desert. People love to fish, canoe, and hike here. every time I hike here. I stand here in awe… fully mindful and present. My worries seem small whenever I stand in this beautiful place. The Salt River is low at this time of year. We can walk out onto the river bed. the Salt River grows much wider and deeper. rocks where we are standing. Saguaro Lake, with 22 miles of shoreline, is actually a reservoir. It was created when the Stewart Mountain Dam was built on the Salt River in 1930. Saguaro Lake is a sparkling gem in the desert! It is very popular with boaters. is surrounded by the wild desert! It’s mid-afternoon already, but our hike continues. just past Butcher Jones Beach. as it meanders along the water’s edge. Be very careful, as we walk up along this narrow, winding trail. We can hike quite a distance, before the trail becomes much too rugged for me. Then we will just turn around and retrace our steps. Looking across the lower Salt River to Red Mountain. The mountain is on the Salt River Pima-Maricopa Native American land. we always stop here to admire Red Mountain. Thank you so much for hiking with us today! I appreciate the time you spend visiting and truly love your comments. no matter where in the world we live. We just returned from a wonderful visit with family in southwest Arizona. Autumn in the desert is truly lovely! 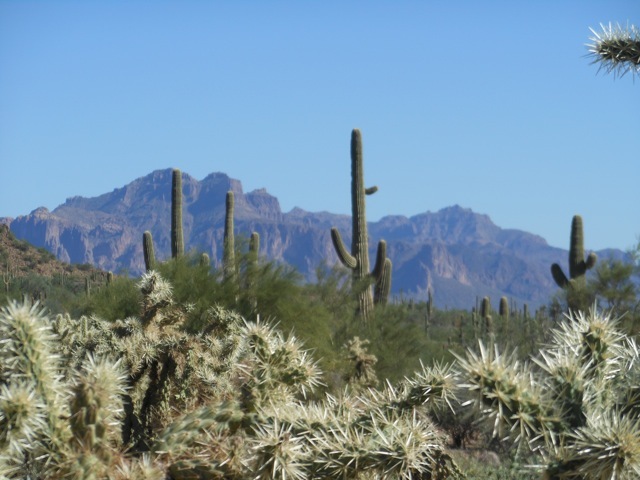 takes us into the beautiful, wild desert of the Tonto National Forest. It is one of the most beautiful places I know. and dry, red earth seem timeless under the bright, blue desert sky. The Saguaro cactus is the state ‘tree’ of Arizona. When it’s my turn to choose our hiking destinations, I always seek out the oases in the desert. in the Tonto National Forest! as it wound its way through the rough, desert terrain. The area near the river felt like a calm, peaceful oasis! The lower Salt River winds its way through the Tonto National forest, in Arizona. is so different from the harsh, dry desert that surrounds it. in the dry, rugged conditions nearby. I always feel at ease hiking along the rocky banks of the Salt River. It feels more familiar to a Midwestern girl! Fish can be seen jumping and splashing in the slow moving water. Reflections of green, deciduous trees catch my attention. Water birds stand quietly on the riverbank before flying off to other nearby spots. Squirrels frolic between the tree roots. where wild horses stop for fresh water. The lower Salt River is a natural boundary between the Tonto National Forest (foreground) and the Pima-Maricopa Indian Community on the other side of the river. we noticed that other people were also attracted to this oasis in the desert. and kayaking along the meandering waterway. Such a comfortable refuge, in the midst of the Sonoran desert! Tall reeds, growing along the riverbank, provide an important habitat for animals that can only survive in this riparian zone. we delighted in a lovely, cool, November day for our hike. The temperature was only 60 degrees as we walked along the river. Puffy clouds above us cast beautiful shadows on the mountains. Welcome rains would fall over night. A Greater roadrunner walked along the road, then walked toward the riverbank. We had a fascinating guest at our picnic lunch at Blue Point! graciously stopping to pose for our camera. as it wandered about looking for its lunch. the Greater roadrunner can run at speeds of 20 miles per hour. This proud roadrunner seemed very content just posing for videos for other hikers! The lower Salt River flows south, with Red Mountain in the distance. 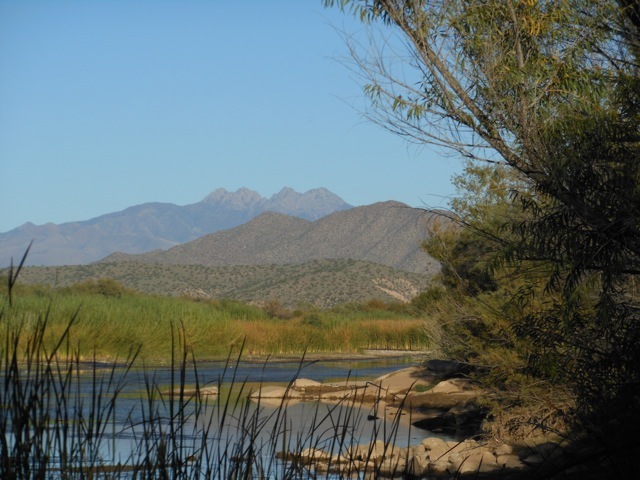 A healthy riparian zone, along the Salt River, benefits everyone. The bushes, grasses, and trees that thrive along the riverbank provide homes for a wide variety of wildlife, prevent soil erosion, and provide flood control by slowing down the water when the Salt River overflows its banks. The shoreline trees shade the water for fish, while the insects, leaves, and twigs that fall into the river become part of the aquatic food chain. During our lifetime, much of the riparian greenbelt has seen a loss of vegetation from clearing farmland nearby, heavy livestock grazing, and the construction of dams that raise and lower the river levels. The trees that grow along the river can only survive the dry periods if their roots are always submerged in water. 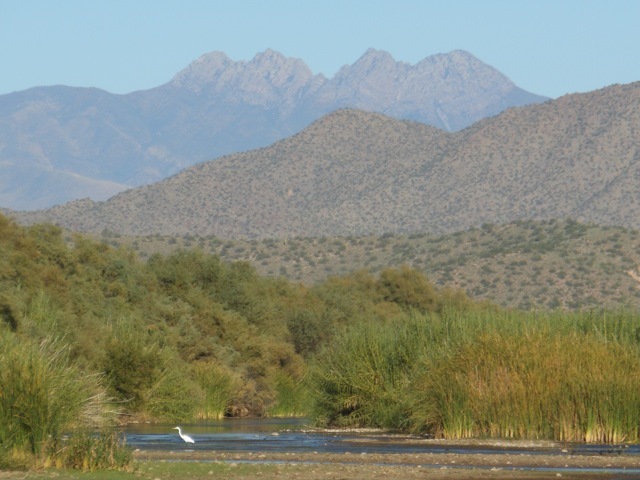 As the population of Arizona continues to grow, the riparian ecosystem faces even more risks. There is such a fragile balance necessary between the growing demands for our natural resources and the health of this important ecosystem in the Sonoran desert. We must take care to protect this wonderful oasis! to spend time in peaceful oases. Treat yourself to some quiet moments of peace. P.S. What places feel like peaceful oases to you? Desert plants and WATER… What a wonderful surprise! Our visit to the American Southwest filled our hearts with wonderful family memories, breathtaking views, and long, quiet hikes in the Sonoran Desert of Arizona. Walking through the harsh, dry, prickly desert terrain under the blazing sun often calls for a brief retreat… an ‘oasis’ in the desert. Fortunately, having visited this beautiful part of America many times, we know just where to find our oasis! Those who live nearby have also made this wonderful discovery. We see them trailering boats and jet skis, walking with fishing gear, and even carrying huge inner tubes. There is nothing more refreshing than finding an oasis in the desert! 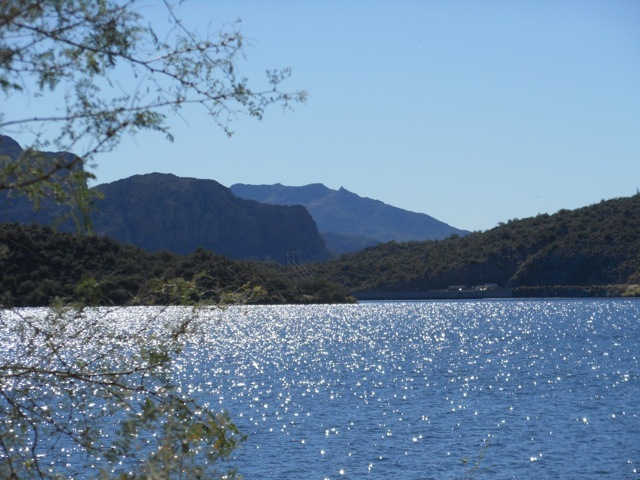 Saguaro Lake is a sparkling jewel in the Tonto National Forest! It is a man-made reservoir, built in the Salt River. This beautiful lake was formed when the Stewart Mountain Dam was built in 1930. Named for the Saguaro Cacti growing nearby, Saguaro Lake has 22 miles of shoreline, a busy marina, and beautiful picnic areas. 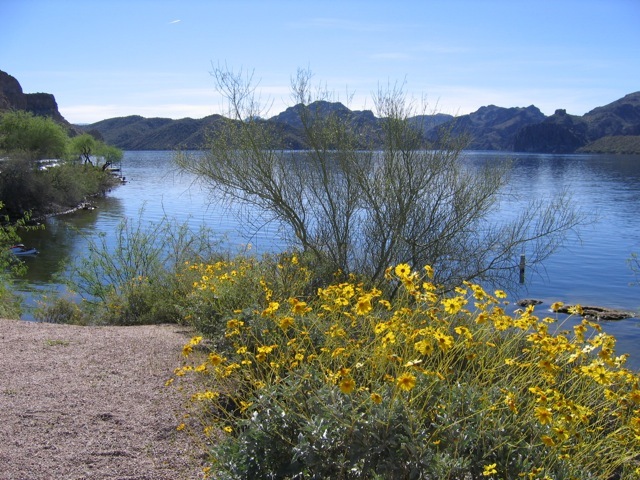 We often enjoy a picnic breakfast or lunch along the shores of Saguaro Lake on a day of hiking in the Tonto National Forest. Saguaro Lake was built in the midst of the wild, untamed desert of the Tonto National Forest. 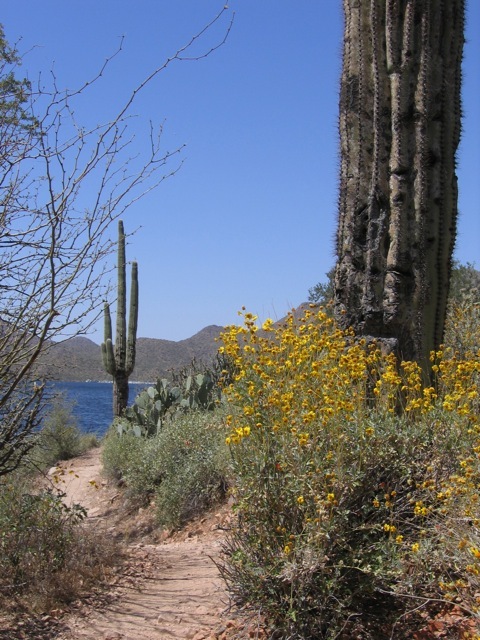 Hiking along the trails surrounding Saguaro Lake is always a delight! It’s a rare treat to find Saguaro cacti, desert wildflowers, Palos Verde trees, and Mesquite trees growing near water. Water birds, desert creatures, boaters, hikers, and fishermen all enjoy a visit to this unique oasis. The Butcher Jones Trail, in the Tonto National Forest, is a spectacular place to hike. 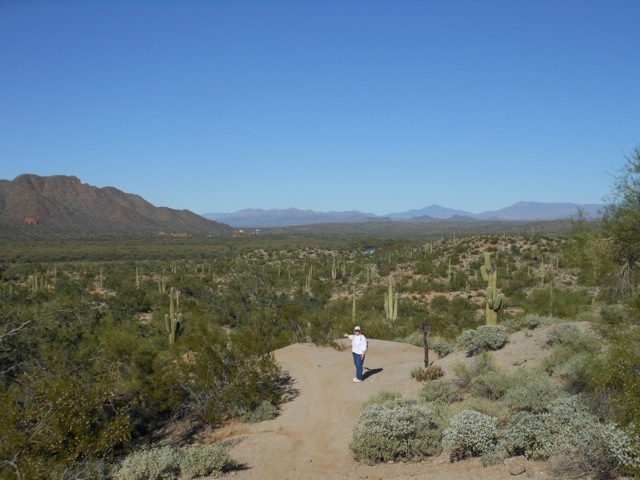 Hiking along the Butcher Jones Trail, on the shores of Saguaro Lake, is a lovely retreat from the harsh desert. At an elevation of 1, 500 feet, the trail begins with a slow incline and with time, becomes steeper and very rocky. We enjoy hiking the easier parts of the trail, stopping often to admire the view. The Salt River provides drinking water and water for irrigation for the metropolitan Phoenix area. Throughout much of the year, parts of the lower Salt River bed are dry and used as roads. The Salt River winds through the Tonto National Forest creating a quiet, serene oasis for desert wildlife and visitors to the area. The lower Salt River forms a natural boundary between the Tonto National Forest and the Fort Apache Indian Reservation. During long periods without rain, the river flows slowly, meandering through the desert. However, from April through October each year, a nearby dam is opened releasing rushing water into the Salt River for tubing. This popular activity draws large crowds for a wet, wild, desert adventure! 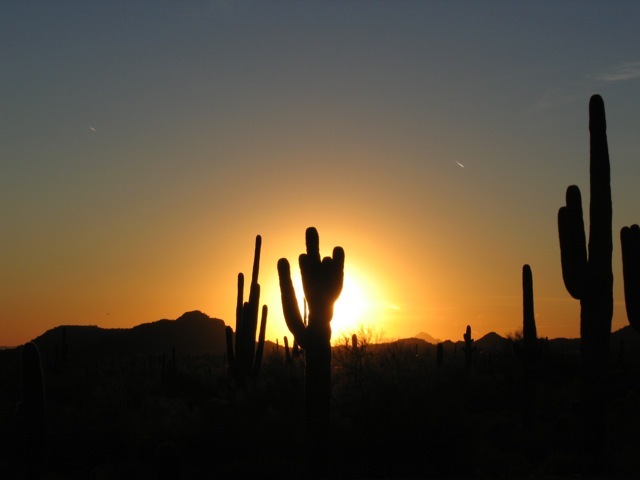 The Sonoran Desert is home to spectacular sunsets, with silhouettes of the Saguaros and the mountains. What a perfect ending for a wonderful vacation! Now we are back home again in the Midwest, enjoying a busy holiday season. The weeks between Thanksgiving Day and Christmas Day are always filled with so many fun holiday preparations. During these busy days, it’s so nice to find a little ‘oasis’ of quiet and calm. 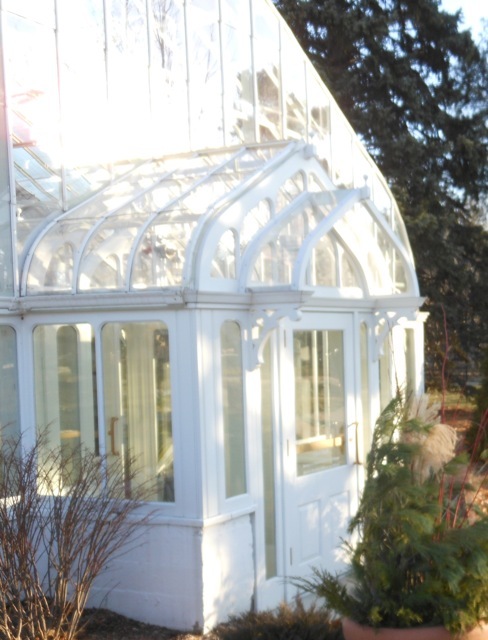 The conservatory is a true ‘oasis’ all year long. My favorite time to visit is during the winter months. I just love to visit the Conservatory in a nearby park. Just a few peaceful moments enjoying the flowers and lush greenery fills me with the same happy feelings that I find in my cottage perennial and herb gardens all summer long. 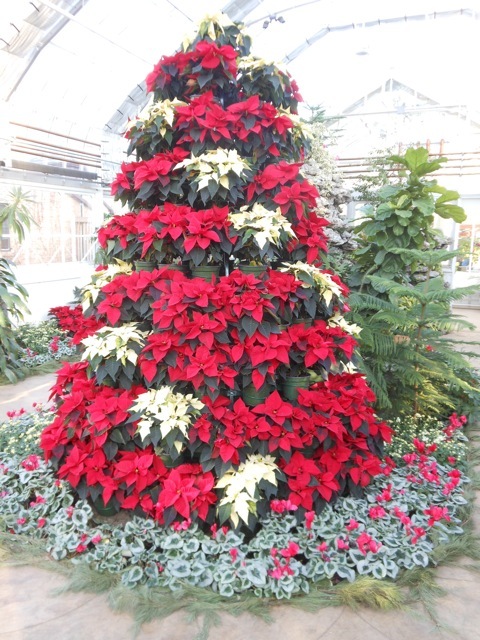 In the Conservatory, red and white Poinsettias, bright red Cyclamen, and Norfolk Pines offer such a cheery contrast to the drab, late Autumn landscape outside. Visiting this little ‘oasis’ always fills my soul with happiness in a most glorious, peaceful way! It’s so important to find or create a little ‘oasis’ of our own during these busy days ~ a pretty place for a brisk walk, a candlelit place with my favorite music, a quiet place to journal about the ‘small moments’ of each day, reading in a rocking chair near the Christmas tree, or creative time in my paper crafting studio always fills my heart with calmness. Just a few minutes in an ‘oasis’ really makes a difference during this busy, most wonderful time of year. I’m going to try extra hard to spend a little time in an ‘oasis’ every day! 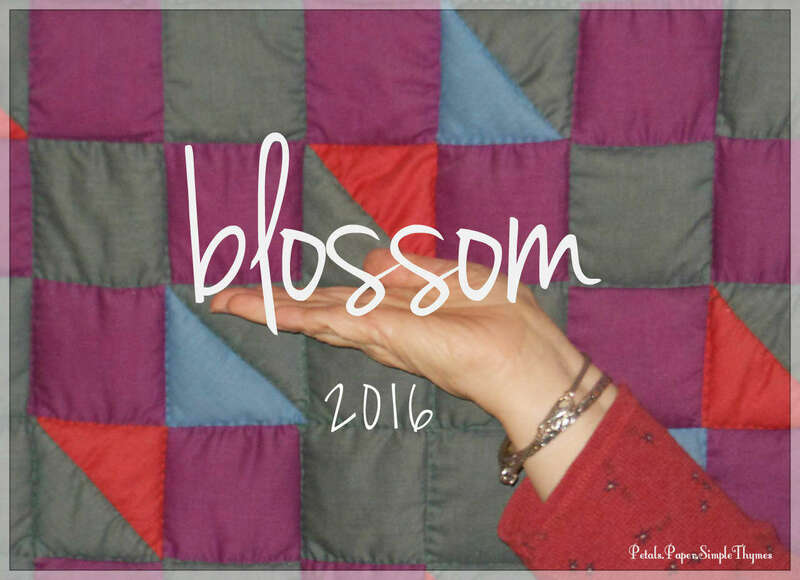 Hoping you will find your own ‘oases’ this season, sweet friends! Warmest wishes & Christmas cheer! Red Mountain towers majestically over the Tonto National Forest in sunny Arizona. Such breathtaking views in every direction! Autumn is a wonderful time to visit the desert Southwest. We just returned from a two week Autumn adventure in Arizona. Visiting family was truly the highlight of our vacation ~ making lots of happy memories together, sharing our favorite stories, and smiling over old family photos together. Each moment was a precious one! A true gem! 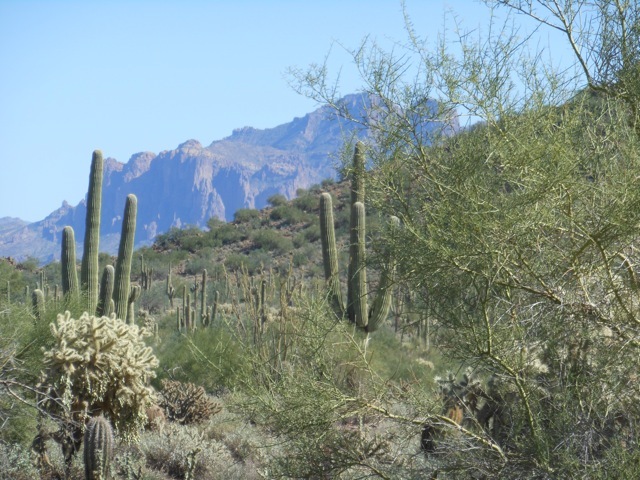 The quiet beauty of the Tonto National Forest makes it one of our favorite places to hike. We thought you might like to hike with us. It’s important to be prepared for walk in the desert. We always remember to wear sturdy hiking boots, hats, and sunscreen. Carrying a bottle of water is really important! I always bring my camera on our hikes and my husband brings his compass (just in case!). Don’t worry, we won’t get lost! 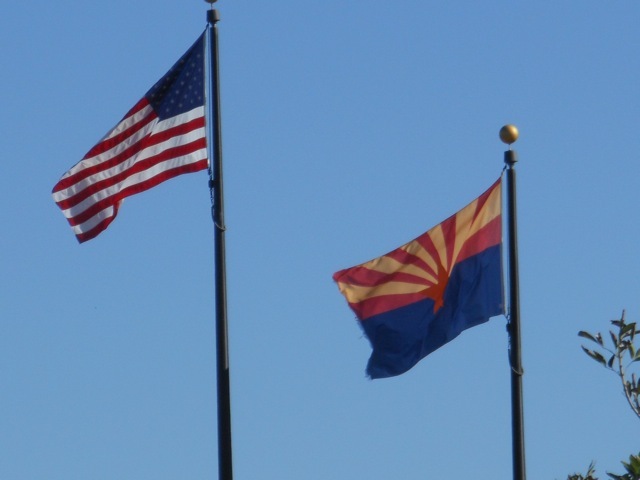 Today we will take you to some of our favorite places in the Tonto National Forest, in sunny Arizona. This is the fifth largest forest in the United States, so there is a lot to see! Four Peaks, in the distance, has the highest elevation in the area. In the winter, snow can be seen on the top of Four Peaks. Silence. It’s the first thing that I always notice in the desert. Only the crunch of our boots on the sand and pebbles breaks the peace and quiet. Blue skies, gentle breezes, warm Autumn sunshine, and beautiful mountains in every direction always energize us as we hike. Named after the Tonto Apache Indians, the Tonto National Forest stretches from Phoenix in the south, to the Mogollon Rim in the north. Our hikes were in the desert habitat in the south part of the forest. The higher elevations in the north are home to tall Pine trees and cooler temperatures. 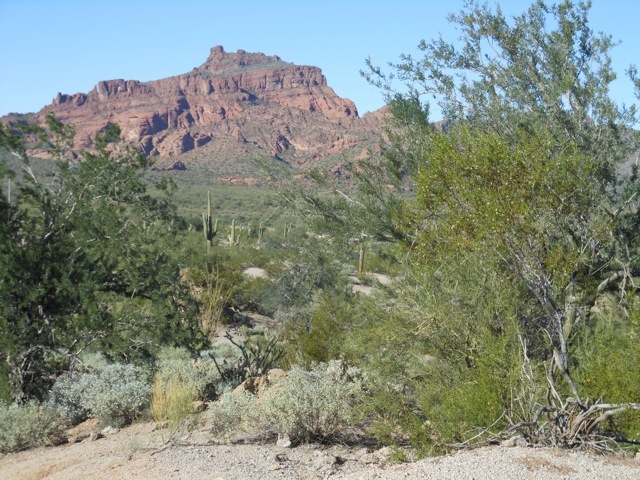 Nine Native American tribes currently live on Tonto National Forest land. Archeological sites are carefully protected here. The Native Americans are ensured the rights to continue to practice their religious and economic activities on what has become public land, since 1905. The tall Saguaro cactus is my favorite desert plant. 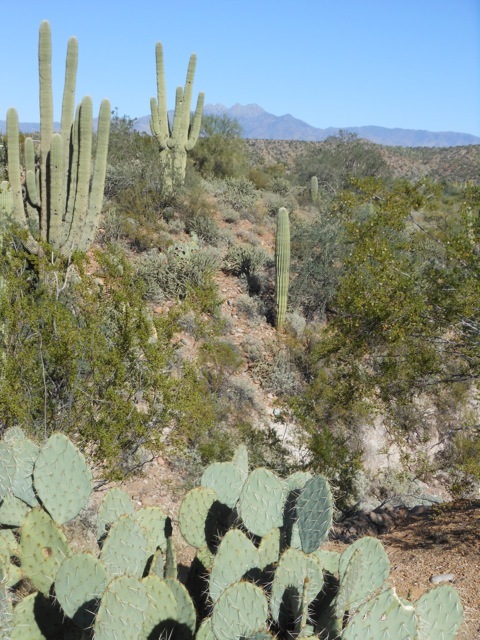 The mountains add to the peaceful, easy feeling of the Tonto National Forest. The Usery Mountains create a lovely background for the desert plants. The lighter stripe along the top of the mountain is the Wind Cave Trail. Over the years, I have only hiked part way up to the Wind Cave, but my husband has climbed the steep, rocky path all the way up to the top of Wind Cave Trail. Beware of the Cholla cactus, with its sharp needles, in the foreground. Little bits of the ‘Jumping Cholla’ are often in our path and we try not to step on them! The giant Saguaro cacti are truly the most amazing plants that I know! The Saguaros will be featured in some posts of their own in a few days. There is so much to share about these fascinating giants of the Sonoran desert. They are so unique and important to the desert habitat! The Superstition Mountains add special beauty to the Sonoran Desert. The mountains seem to change color from moment to moment all day long. Clouds, although rare over the desert, cast beautiful dramatic shadows on the mountainsides. It’s such a treat to behold! The Salt River looks more like a stream as it flows through the Tonto National Forest this Autumn. The Salt River meanders through the Tonto National Forest most of the year. Several dams control its water levels for irrigation and drinking water supplies to the area. Outdoor enthusiasts enjoy fishing when the water is low and tubing in the deeper, fast moving waters of the Salt River. Often when we visit, we are able to hike on the dry river bed of the Salt River, seeing the desert vistas from a unique perspective. 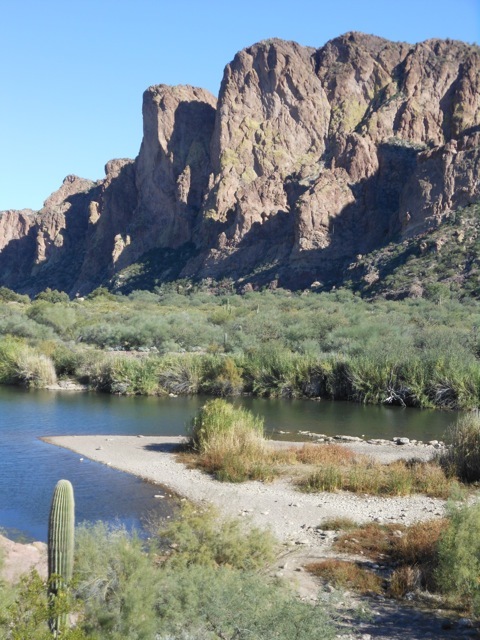 The Salt River is also a natural boundary separating the Tonto National Forest from the Fort Apache Indian Reservation. While hiking, if we stop and stand very still, we can see wildlife of all kinds. Lizards scuttle across the desert floor. Roadrunners and quail scurry across the ground, while hummingbirds, woodpeckers, and doves dart about. Overhead, hawks and vultures soar over the desert. I love hearing the unfamiliar birdsong in the desert as we walk. Jackrabbits, javelinas, desert chipmunks, coyotes, and an occasional bobcat have been spotted moving across the desert in our recent visits. We have watched so many butterflies collecting pollen from the late Autumn flowers in the desert. Holes in the dry, desert soil remind us that rattlesnakes might be waiting out of sight, while rocks provide shelter for scorpions, beetles, and other creatures. 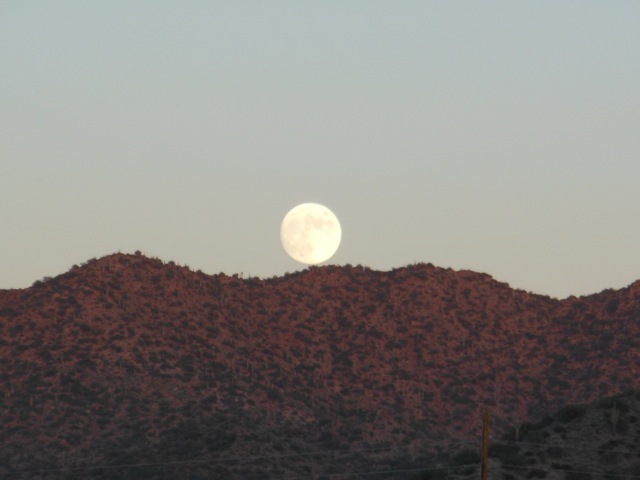 Watching the Full Frost Moon rise over the Usery Mountains was a special memory this visit! We really looked forward to our moonlight hike in the Sonoran Desert under the Full Frost Moon. With rangers to guide us, and flashlights and water bottles in hand, we met at the trailhead at dusk. To our surprise, two hundred other hikers had the same plan! So, all the hikers ~ boy scouts, families, and other visitors ~ walked two miles under the Frost Moon together, through the desert washes and amidst the cacti, with flashlights to guide us through the desert terrain. Informative rangers taught us about the history, wildlife, and plants of the desert during our hike. For days, I had been wondering worrying what creatures might approach us during our nighttime hike. No need to worry!! I’m sure that the sound of four hundred feet pounding the desert floor frightened away every creature within miles ~ except for one very large, black, ground beetle in our path! We felt so sorry for frightening him that night!! There is so much beauty everywhere! 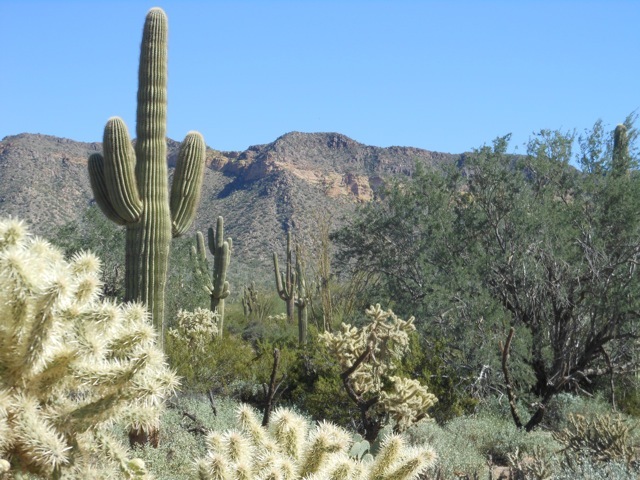 There is so much more to see in the Sonoran Desert! Let’s meet back here again to explore the flora and fauna of the desert. I think you will be fascinated by the life cycle of the giant Saguaro cactus. We will hike together through Saguaro National Park very soon. There are some important ‘words of wisdom’ to share… and an unexpected surprise is awaiting, too! I’m already looking forward to our next hike! It’s the perfect way to chase away the Winter chill! It’s great to visit Arizona in Autumn!